Do staffies get on with other dogs? A common question for prospective and new owners. As with most dogs, the answer will depend somewhat on their uprbringing but they most certainly can get along just fine with other dogs. 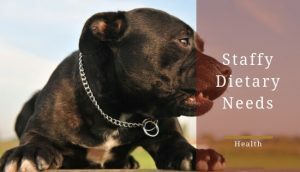 For the most part, staffies are usually quite friendly to other dogs that are part of their family home. However, they can be a bit wary of dogs from outside and they will be more than willing to fight if challenged, which can give them an unwarranted bad reputation. Fortunately, there are some steps you can take as an owner to make your dog's interactions with others go as smoothly as possible. 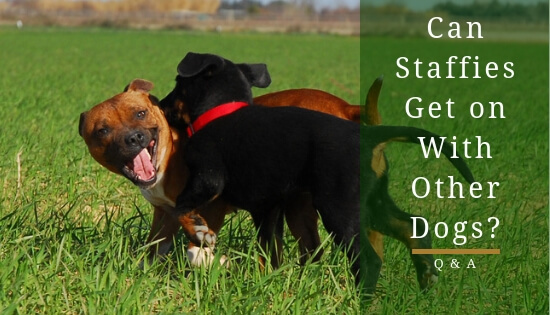 This article with outline a few simple tips to help your staffy get along with other dogs. Introducing your staffy to other dogs at an early age is crucial in cultivating a dog-friendly personality. If you do this, it will ingrain in them that other dogs are their friends rather than enemies. They’ll grow up in an environment where other dogs aren’t complete strangers to them. In comparison, a non-socialised dog will see other dogs as threats because they represent a threat toward their safe, controlled environment. Therefore, it’s necessary to have your staffy meet other dogs in controlled doses. For example, have them meet a friend's dog-friendly dog before bringing them to a dog park. Also, make sure this meeting takes place on neutral ground. 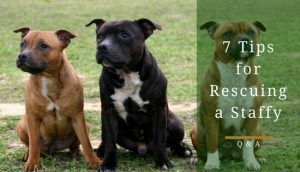 Your staffy or the other dog might act protectively over somewhere that feels like home to them. I’d recommend a place like an open field or maybe an outdoor trail. To be safe, when first meeting other dogs, you may begin with your own dog in a muzzle. Be sure you have got your dog comfortable with a muzzle first as this could stress them out and cause aggressive behaviour. You should be aiming to walk as part of their daily exercise but it can also help them to socialise. Being outdoors helps them become more comfortable with the overwhelming nature of the outside world. If you keep your pup inside all day, they will never get used to being around "stranger" dogs. Also, mixing up your walking route will help your dog become increasingly more sociable. By switching the course up, you’re exposing your dog to more of the outside world. They’re going to start quickly understanding none of these things they were barking at before are dangerous. In fact, they’ll soon understand a walk is an excellent way of meeting new friends. In the end, it’s all about making your staffy feel more comfortable. And provide them with different experiences on their daily walks is a great way of doing so. Now, I understand some owners don’t have the time for daily walks. After all, people tend to have hectic lives; especially, ones who can afford a dog. 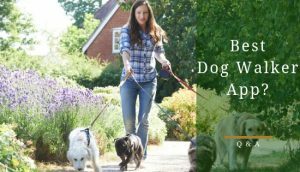 Thankfully, dog walkers exist and can help you socialise your dog to the outside world. You can even request to have your staffy walk side by side with another dog. If you’re not comfortable with a stranger walking your dog, have a work from home friend come over and walk them for you. Either way, daily walks will do wonders for your pup’s progress into becoming a dog-friendly staffy. Honestly, it’s imperative you get your dog out in the world. Don’t be an owner who leaves them at home all day. This sense of being confined inside brings out aggressive tendencies within dogs. If you don’t feel entirely confident in your ability to socialise your staffy, ask your vet about training classes they’d recommend. Training classes will both expose your pup to other dogs and get them some training. 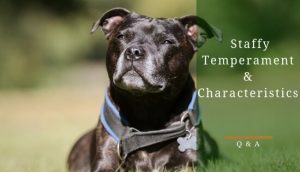 As we all know, staffies are a little stubborn about their training, so, a training class could a great way to work around your pup’s stubbornness. Honestly, why would you do it yourself when professionals are available anyway? I know, for the bonding experience, but these classes do help speed up the process considerably. Of course, these classes are expensive; however, they do wonders for helping a dog understand other dogs are friends rather than enemies. But again, consult with a vet first before signing up for one and do your research to ensure you attend a class run by a reputable behaviourist. 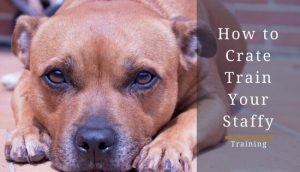 All dogs love treats and staffies are no different, which means you can use this to reinforce a positive attitude towards other dogs. For example, any time your dog has a successful interaction with another dog give them a treat. The treat will tell them how they acted was deemed reward-worthy. In response, they’ll continue this behavior to try and get more treats. As you probably know by now, positive reinforcement is a powerful thing. 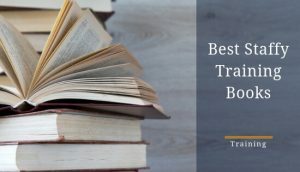 It will get you excellent results in all types of training. However, don’t give out these treats without adjusting their meals. Take into account the number of treats you’re giving your staffy and change their meals accordingly. 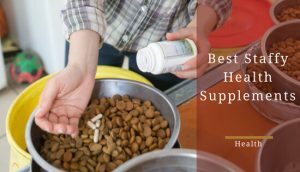 You don’t want to do all this work in making them dog–friendly than realize you have a more significant problem with them being overweight. As mentioned before, starting your dog's training early is essential in making them dog-friendly. About 3 to 12 weeks is the age range to begin socialising your dog. 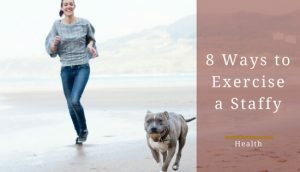 I know, three weeks sounds crazy, however, it can make a tremendous difference on your staffy’s personality. Unfortunately, socialising your dog becomes much more difficult around 18 weeks (4 months). At this age, they start getting set in their ways. However, if you haven’t start socialising your staffy before 18 weeks, there’s no need to worry. You can teach being dog-friendly to an older dog, but, it will take some effort. Again, dog-aggressive dogs aren’t born that way. It’s either their owners didn’t take enough time to socialise them or something horrible happened. So please, take your staffy out into the world at an early age and get them used to other dogs. It will make both theirs and your life a lot better.